I never thought I’d be the kind of person who would study abroad. In fact, I never thought I would leave Richmond. I was becoming competent in the German language by practicing religiously on Skype with Germans I had met through a language exchange website. These Germans were all STEM students (a pharmacist, a mathematician, a chemist and a computer programmer). By learning about their experiences in Germany, I quickly became inspired by how the country has become a world leader in STEM education. I wanted to experience firsthand how the country operated and why it was so successful, so I decided to make an appointment with the study abroad office (GEO). The rest is history. What program and destination did you choose? What manifested from this decision to meet with GEO was something I never expected. I ended up studying abroad in Braunschweig, Germany for ten months. Technische Universität Braunschweig is an engineering and science university with a focus on practical, applied learning. I transferred back second semester Biochemistry, Ecological Biochemistry, and Plant Biochemistry. I also completed a Molecular Genetics laboratory course. The most challenging part was the lab work. German biology students are rather advanced in lab and analytical skills as their education focuses on intensive, hands-on approaches. I had to interact and write my tests and lab reports in German. It was extremely challenging at first because my German lacked the vocabulary to express scientific ideas, but I overcame this with the help of my German peers. As a result, my competency in the language skyrocketed. Bachelor students in Braunschweig have an intensive curriculum. Their first year consists of biology, biochemistry, organic and inorganic chemistry, plant and animal sciences, genetics and microbiology. This is all with a laboratory experience, too. They only have to do one or two electives for their whole degree! This is quite different from an American Bachelor’s education in which the focus is more on liberal arts and theory. I was way behind when I started, but I worked hard to gain these skills and competencies in the laboratory. Additionally, I attended German language courses and lectures in fields such as genetics, geomicrobiology, physics for biologists, and environmental toxicology. I even studied Spanish and Swedish! I was happy to study here. I think the laboratory, analytic and practical education complimented VCU’s theoretical approach. When I returned to VCU, I was able to take my new laboratory experience and use it in Dr. Wenheng Zhang’s lab. What research did you participate in while abroad? All biology students in Germany are required to do thesis work. In fact, the top German universities require such an experience for the acceptance into a Master’s program, so many foreigners (like Americans) may be excluded. Thesis work entails much more than your own project. You are expected to work nine to five every day in the lab for three to five months. Perhaps the most exciting part of my time in Germany was meeting a post-doc who invited me to do research for five months. Starting in May, I will work full-time in her lab assisting current research studies and undertaking my own research project. Her lab focuses on understanding and mapping specific pathways in the cell that are involved in the inflammatory response. Personally, I will research the cross-talk between Glucocorticoids and Interleukin-6 on the expression of a relatively unknown gene Redd1. I’m extremely excited to improve my laboratory and research skills and to work in a collaborative environment. My advisor is a biochemist, more or less. We will be using molecular biology and biochemical approaches to answer our questions. I’m thankful that I was able to take all the biochemistry and molecular biology and get the related lab experience for it in Braunschweig. I learned cross-cultural skills and experienced how another country operates, both culturally and academically. I became even more proficient in German and had the chance to travel around Germany and other countries including Czech Republic, Denmark and Sweden. I experienced first-hand why Germany is an economic and scientific leader of the world. I don’t know what is in store for my future, but I know my study abroad and international research experience will help me in graduate school or professional work. I hope everyone reading this ignores your study abroad anxieties and make an appointment with the GEO office to discuss your possibilities. You never know what will happen. For prospective study abroad students, I have advice for you based of my own experiences. My time in Germany wasn’t a cakewalk. I did have many set-backs and challenges. Start your research early. Due dates for scholarships and applications are usually way in advance. Work closely with your GEO and biology department advisor. Your GEO advisor will help you find programs and funding opportunities and help you navigate the logistics. Before you go make sure your prospective coursework will transfer back. Understand how your experience will affect your intended graduation date and discuss getting prerequisites done for classes you may take abroad. Find a way to make your experience abroad work FOR you! Although I had a semester left at VCU, I found work in Dr. Zhang’s lab. I was able to use my laboratory experience in genetics to assist in her lab. People with international experience stand out academically and professionally as well-rounded and motivated individuals. The Connecticut Institute for Clinical and Translational Science (CICATS) at the University of Connecticut (UConn), a cross university translational institute led by Dr. Cato T. Laurencin, is pleased to announce an exciting research opportunity. The Young Innovative Investigator Program (YIIP) is now accepting applications. YIIP provides academic training to underrepresented minority students dedicated to pursuing careers as scientists and scholars in biological and biomedical science with the intent of developing the next generation of innovative biomedical scientists while increasing diversity among the pool of academic scientists. Scholarships are available to students accepted to the program. The deadline for YIIP applications is April 25, 2018. YIIP is a one to two year, full-time program at UConn for college graduates who are prepared to conduct supervised research in biomedical laboratories on the UConn Health campus in Farmington, Connecticut. The program also provides students with individualized mentorship, academic support, and career guidance. This is NOT a post-baccalaureate program. The applicant must be prepared to complete graduate level scientific coursework. Upon successful completion of coursework in year one, students obtain a Graduate Certificate of Research Experience in Biomedical Science from UConn. In year two, students who meet the academic qualifications may have the opportunity to pursue a Master of Science degree. By fulfilling the program requirements, YIIP Scholars will acquire the expertise necessary to enter a M.D., M.D.-Ph.D. or Ph.D. program. 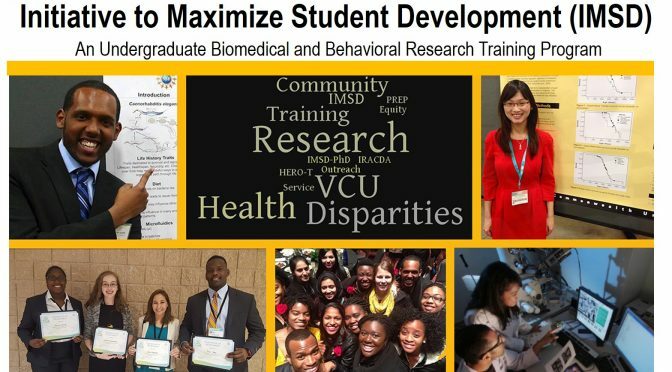 The VCU Post-Baccalaureate Research Training Program (PREP) is a one-year biomedical research training program for recent college graduates from underrepresented groups considering graduate-level training in the biomedical sciences. The program provides scholars with a year-long paid mentored research experience and the opportunity to develop technical and critical-thinking skills. PREP scholars have the opportunity to take graduate-level courses and a GRE preparation course, as well as receive formal advice on the selection of graduate programs, preparation of graduate school applications, and preparation for graduate school interviews. Eligible applicants must have graduated prior to program start on July 1. Students must be interested in pursuing a PhD . Applicants must have graduated within 3 years of program start. Applicants must be US Citizens, permanent residents or non-citizen nationals with proof of citizenship status. 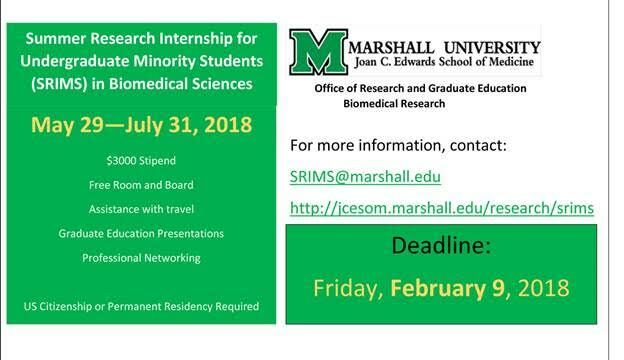 We are looking to recruit 10 eager young biomedical or behavioral researchers from backgrounds traditionally underrepresented in the biomedical sciences who are excited to engage in a research intensive curriculum and a long term biomedical or behavioral research experience. More details about what the program has to offer can be found below. ¨ Up to 2 Full years of Mentored Research! Successful applicants must have a strong desire to pursue a PhD in the Biomedical or Behavioral Sciences. Applicants must have at minimum 3 remaining semesters at VCU but are encouraged to apply as early as their freshman year. A GPA over 2.8 in major is preferred. Eligible applicants must be current full-time VCU undergraduate students, and must be U.S. citizens, permanent residents or non-citizen nationals. Proof of citizenship status or resident status will be required. Applicants can be from any Science major (eg. BIOL, BNFO, BME, CHEM, CLSE, PSYCH). Successful applications will be expected to participate in a 1 week “Molecular lab skills bootcamp” from May 14th-18th to prepare them for their laboratory experiences. Students will receive help with securing a research mentor but are encouraged to start this process before being admitted (this will be seen as a positive!). Intensive summer research program – IMSD scholars must dedicate 40 hours a week for 10 weeks (May 29th – Aug 3rd) in the summer to research. During the summer program scholars participate in an array of enrichment activities such as; seminars (on careers, research, graduate school), Discussions with professors, graduate students, and post-doctoral fellows, and other research themed topics. Students must participate in the CoHD GRE preparation course. (offered in July). 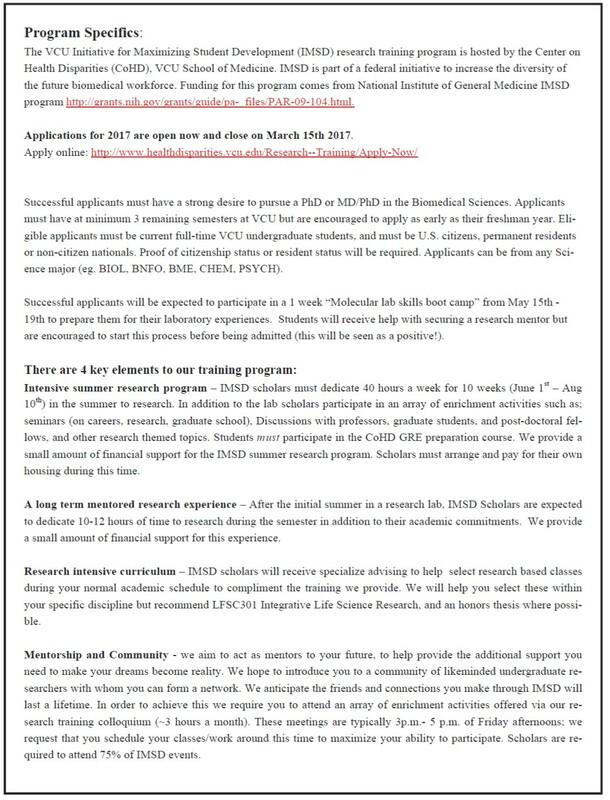 We provide a small amount of financial support for the IMSD summer research program. Scholars must arrange and pay for their own housing during this time. 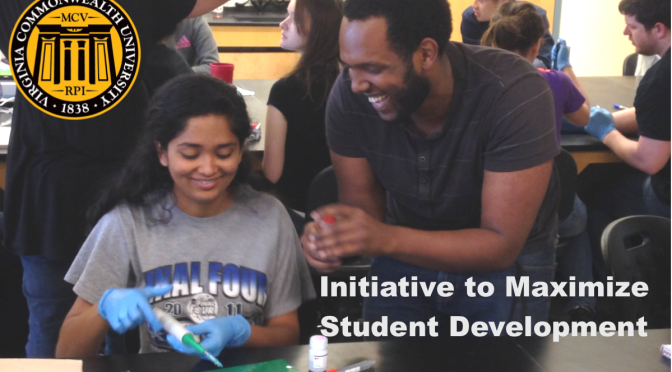 Scholars can participate in 2 consecutive summers of research via the IMSD program. A llong-termmentored research experience – After the initial summer in a research lab, IMSD Scholars are expected to dedicate 10-12 hours of time to research during the semester in addition to their academic commitments. We provide a small amount of financial support for this experience. classes during your normal academic schedule to compliment the training we provide. We will help you select these within your specific discipline but strongly recommend BIOL392 Introduction to Research, and an honors thesis if possible. Mentorship and Community – IMSD undergraduate is one of 4 research training programs in the CoHD family. We aim to act as mentors to your future, to help provide the additional support you need to make your dreams become reality. We hope to introduce you to a community of likeminded peers with whom you can form a network. We anticipate the friends and connections you make through IMSD and other CoHD research training programs will last a lifetime. In order to achieve this we require you to attend an array of enrichment activities offered via our research training colloquium (~3 hours a month). These meetings are typically 3-5 pm of Friday afternoons; we request that you schedule your classes/work around this time to maximize your ability to participate. Scholars are required to attend 75% of IMSD events. We look forward to receiving your applications! 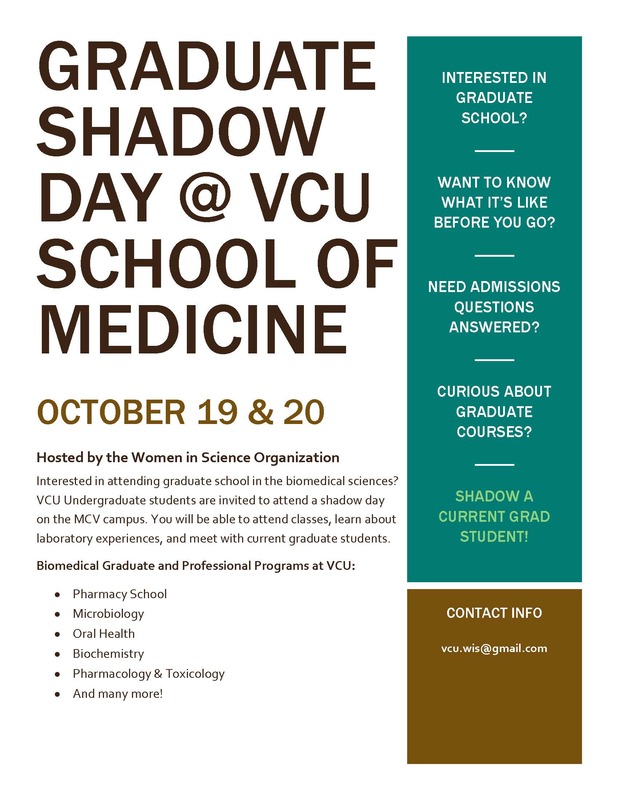 Please email cohdtraining@vcuhealth.org with any questions. 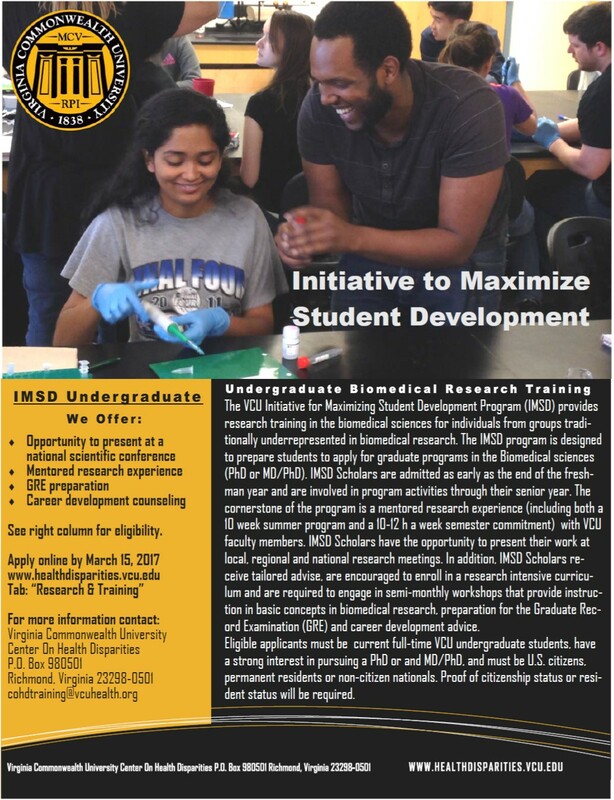 The VCU Initiative to Maximize Student Development (IMSD) research training program. We are looking to recruit eager young biomedical researchers from backgrounds traditionally underrepresented in the biomedical sciences who are excited to engage in a research intensive curriculum and a long term biomedical research experience. Click here to download the registration form with directions. 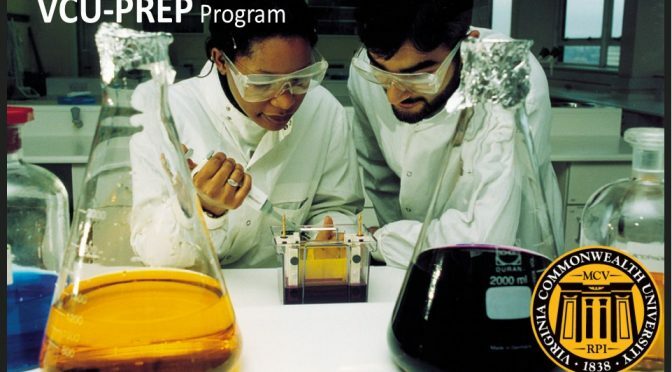 VCU-PREP is a post-baccalaureate research program that aims to increase the number of underrepresented PhD students in the US (for example, African Americans, Hispanic Americans, students with disabilities, etc). In the program, students participate in an intensive mentored research experience in an area of biomedical research of their choice, and receive coaching and preparation to take the GRE and apply to PhD programs. Additional program information is included in our brochure on the VCU Center on Health Disparities website at http://www.healthdisparities.vcu.edu/. The on-line application is also available there, under the Research & Training tab under Apply Now. The applicant must be a US citizen, permanent resident, or US national to be eligible for the VCU-PREP program. Applicants must have earned a baccalaureate degree or its equivalent at the time of enrollment (July 1, 2016), and no more than 36 months prior to their selection for participation. An undergraduate cumulative GPA of at least 3.0 is generally expected for VCU-PREP scholars. The application should include: undergraduate transcripts, 3 letters of recommendation from teachers or research mentors, and a personal statement demonstrating a commitment to a career in biomedical research. The supplementary materials (letters and transcripts) can be sent by email to cohdtraining@vcuhealth.org. The deadline to receive your application, transcripts and letters of reference is March 15, 2016. If you have questions about the application process, please contact Ms. Khiana Meade at cohdtraining@vcuhealth.org. If you have questions about research in the biomedical sciences at VCU, please contact the VCU-PREP Program Director, Dr. Joyce Lloyd, at joyce.lloyd@vcuhealth.org.